Doctor Strange is the latest of the Marvel Comics superheroes to appear on screen. 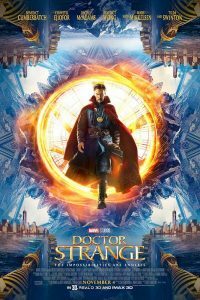 It tells the story of Dr. Stephen Strange (Benedict Cumberbatch), a brilliant, but narcissistic, neurosurgeon. Strange is seriously injured in an auto accident. He wants to be able to perform surgery again, but has not gained full use of his hands. Strange will go to any lengths to be able to use his hands again. He finds another man who completely recovered from terrible injuries. This man tells Strange that he went to remote India to receive treatment. Desperate for a cure, Strange follows this lead. In India, Strange encounters a woman known as the Ancient One (Tilda Swinton) who says she can heal him, but concentrates on his mind and spirit, rather than purely a physical cure. Strange scoffs at first. Then, guided by the Ancient One, he has an experience of the spirit separated from the body. With skepticism, Strange stays on and learns from the Ancient One. The lessons taught by the Ancient One are good spiritual lessons. Strange must learn humility and get rid of his enormous ego. The proud, brilliant Strange has a very difficult time learning these lessons. But he perseveres and makes progress. The Ancient One is kind of a “Yoda” type figure from Star Wars: an unlikely Warrior. She has been fighting evil for centuries (true to her name, no one has a clue how old she is). Eventually she enlists Strange in the battle of good against evil. Dr. Strange has a lot going for it, beginning with a top notch cast. In addition to Cumberbatch and Swinton, the cast also includes Chiwetel Ejiofor (12 Years a Slave) as one of the Ancient One’s assistants, and Rachel McAdams as a Dr. Christine Palmer, a colleague of Strange who loves him. In his self-pity, Strange drives her away after the accident. Dr. Strange also has outstanding special effects and sets. The movie looks great, and I’d be very surprised if the special effects (it’s hard to explain them; they have to be seen) will almost certainly be mentioned at Oscar time. The screenplay by Jon Spaihts and Scott Derrickson (who also directed) includes some welcome humor to the serious goings-on. All in all it’s pretty entertaining, even if you’re not one who normally frequents these comic-book movies. My major qualm is that, unlike most movies of this genre, the villain isn’t very interesting or memorable. I can’t remember his name or exactly what he wanted to do that was so horrible. Also the final battle scenes between the good guys and the bad guys go on far too long. Enough is enough! If you make it through the ending credits, you will see that there is already a sequel planned for Dr. Strange, which I’m sure will come to no surprise to anyone.